JOE KERNEN: Appreciate it. You were at the UN. You had some comments that I'm catching wind of about Venezuela. What are we going to do? What's the current situation, current thinking on how we handle this? 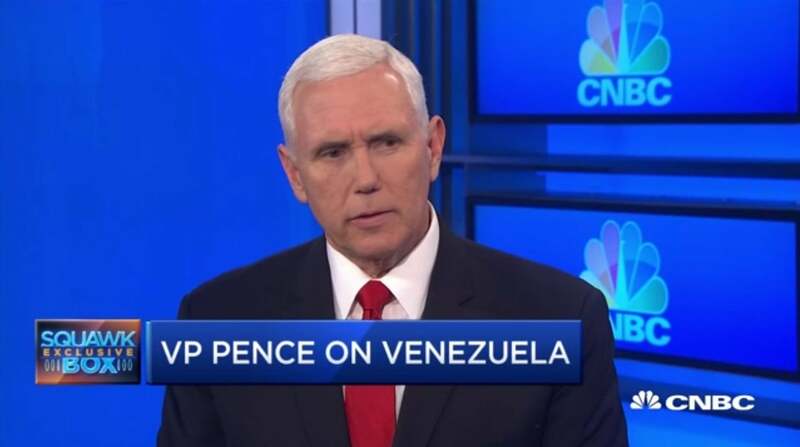 VICE PRESIDENT MIKE PENCE: Well, over the past six years the people of Venezuela have been suffering through depravation and the dictatorship of Nicolas Maduro. From the early days of this administration President Trump has made it clear Nicolas Maduro has no legitimate claim to power and Nicolas Maduro must go. And yesterday, I went to the United Nations. We delivered a message that now that the organization of American states has recognized Juan Guaido as a legitimate government of Venezuela, now that the G7 has spoken out, 54 nations have followed President Trump's lead to recognize President Juan Guaido and his administration. Now it's time for the United Nations to act. And the United States will be introducing a resolution into the UN in the days ahead that will recognize Juan Guaido's government, that will denounce the dictatorship of Nicolas Maduro. And we called on the UN to revoke the credentials of Venezuela's representative to the United Nations and recognize the duly appointed representative of the Democratically-elected government of Venezuela. JOE KERNEN: Alright. Let's bring it back home. The President gives the State of the Union every year. If you were tasked to give an economic State of the Union right now, what would you say? How would you characterize it? VICE PRESIDENT MIKE PENCE: Well, the American economy is soaring thanks to the leadership of President Donald Trump. From the first day of this administration, this President's been working to get this economy moving again. Cutting taxes, rolling back federal red tape, unleashing American energy. And here we are, 5.5 million jobs later, record unemployment for African-Americans, Hispanic-Americans, unemployment for women is at a 60-year low. And of course, the stock market has been soaring. And I think it's all because this is a President who has kept his promises to the American people. He's kept his promises to put into practice what we know has always made this country strong and prosperous and the results really speak for themselves. JOE KERNEN: Well, 3% last year. But decelerating a little in in the fourth quarter. First quarter, obviously we don't know yet. But it's going to be lower than probably where the fourth quarter was at what-- 2.2, 2.4 whatever it was. And this year, we don't know obviously, but we're hearing 2.2 to 2.3. That's deceleration. People will point to the promise of what tax reform was going to do and say that it's not measuring up. VICE PRESIDENT MIKE PENCE: Well, I beg to differ. Obviously the February jobs report, we thought was an anomaly and it was. Last Friday's report told the tale of a growing economy, robust energy. I mean, look what's happening in manufacturing alone, Joe. I mean, I remember in the summer of 2016 when I was just joining this ticket, the last president was saying, ‘What are we going to do, wave a magic wand to bring back manufacturing jobs?’ And President Trump said, ‘No we can bring jobs back. We can-- we can cut taxes for businesses, roll back federal red tape, unleash American energy, fight for trade deals to put American jobs and American workers first.’ And here we are; 500,000 good paying manufacturing jobs have come back to the United States. So we really think we've just begun to scratch the surface of economic growth. Last year 3%, 5.5 million jobs since Election Day. But you think about the last eight years of less than 2% economic growth in the most powerful economy in the history of the world. President Trump said, ‘We could do better.’ President Trump said, ‘We could be growing again.’ And we are. JOE KERNEN: So no recession fears that— which, well, we had an inverted yield curve, we had, you know, China— the trade war, we had Europe slowing down. The jobs number was one good data point on Friday. And also China looked like it recovered and China's stock market is doing pretty well. So no recession fears, that's off the table, in your view, at this point? VICE PRESIDENT MIKE PENCE: We don't-- we don't have any concern. I think the Treasury Secretary said that on your air as well. No concerns about a recession. JOE KERNEN: Okay, then, I’ve got to ask you, Larry Kudlow-- a colleague of mine, he's been a great friend, a great American, obviously, as he likes to-- we like to call him. It says two more -- we need two rate cuts. The President was talking about quantitative easing. If things are so great I don't-- I don't understand going back to these emergency procedures and things that we did during the financial crisis. We-- at this point people say we don't have dry powder for the next slow down. Why would we cut rates again? Why would we stop, you know, letting the balance sheet roll off? VICE PRESIDENT MIKE PENCE: Well, you saw the consumer numbers that came out yesterday though, Joe. I mean, there-- there's no evidence of inflation in this economy. JOE KERNEN: So it's inflation. JOE KERNEN: I missed that. VICE PRESIDENT MIKE PENCE: --like many Presidents have before him. VICE PRESIDENT MIKE PENCE: I mean, this is a President that really does believe that this economy's only starting to grow. I mean, you look at-- you look at nations around the world, nations that we compete with every day. And president really does believe that 3% is a starting point in this economy. JOE KERNEN: --at the Fed? VICE PRESIDENT MIKE PENCE: --job growth and job creation. VICE PRESIDENT MIKE PENCE: Look, I-- the President's never made a secret about his concerns about some of the decisions that the Fed has made. But President Trump respects the independence of the Federal Reserve. And, I—but I really do believe that what you have in this president-- is someone who's got a boundless confidence in the American people. That if we-- if we'll have sound monetary policy-- if-- if we'll-- if we'll continue-- if we'll reelect a Republican majority in the Congress this fall, in the House of Representatives, if we'll continue to build in the momentum that we have we've only just begun to see this economy growing. JOE KERNEN: How about Herman Cain? Is that nomination-- I know the-- the President responded to a question today and said the determination of whether his nomination is safe is up to Herman Cain. He's a great guy and I hope-- I hope things work out for him. Doesn't sound like a ringing endorsement. Do you know anything we don't know about that nomination? JOE KERNEN: In Kansas City, yeah. VICE PRESIDENT MIKE PENCE: --at the Federal Reserve. And has that that background. And he and Stephen Moore both are people that really understand what the president's philosophy is in this economy. And-- but we'll see how it plays out. JOE KERNEN: I’ve got so many things that-- that I want to try and get through. So, buybacks and capital spending. I'm going to combine the two. The capital spending, would you say it's been satisfactory in terms of what we were hoping for with tax reform? A lot of people say that it's ramping up but slowly. Others say that there's-- they don't like buybacks. I’m not necessarily in that camp. And maybe we should induce, maybe tax them like dividends so that companies aren't more prone to use the cash for buybacks, they’ll use it for capital spending. VICE PRESIDENT MIKE PENCE: I’ve got to be honest with you, the, you know-- what the American people have identified in this president is somebody that understands how you create jobs in this country. I mean, we had one of the highest tax rates for businesses in the industrialized world. And now, thanks to the president's efforts, we have a lower business tax rate than most industrialized countries, below the average. In the midst of that, as you look at all these different statistics the one that I think-- the president and I find most moving is how wages that have been so stubborn over the last decade, wages have started to move up across the spectrum. But most-- the most rapid increase in wages has been among blue collar working Americans. I mean, the president used to use that phrase, the forgotten men and women. And when you look at the fact that wages are finally rising again, particularly among working men and women across this country, that tells you the forgotten men and women of America are forgotten no more. So we'll continue to push those policies, make it possible for businesses to invest in ways that will create jobs and we'll continue to see the kind of results that we've been seeing. JOE KERNEN: Where are we at-- the snapshot of negotiations with China right now and the summit with President Xi? Is there anything you can tell us, update us on where we stand on progress that's being made? VICE PRESIDENT MIKE PENCE: Well, I know the President's being continuously updated and engaged in that process. And as he said many times, we remain hopeful. But we'll see. President Trump, different from prior administrations, literally going back decades since we admitted China into the World Trade Organization. Kind of-- we kind of made a bet that if we if we opened up access to China to world markets and we engaged in broader trade that we would see China embrace the kind of policies that would respect private property rights and open up their markets to the west. And candidly, that hasn't happened. And that's why President Trump imposed $250 billion in tariffs on China. He's made it clear we're in a position we could more than double that. But we hope for better. And I do know negotiations are underway, not to address a trade deficit with China. About half of our international trade deficit is with China. But also to address things like intellectual property rights and the structural reforms, force technology transfers. That's all on the table. And I do know from being briefed myself by the USTR this week that those negotiations are ongoing, underway and as the President often says, "We'll see." JOE KERNEN: The Wealth of Nations was written in 1776 I think. A great year for the world for a lot of reasons. But we're arguing about socialism again and we're arguing about free markets again. VICE PRESIDENT MIKE PENCE: Incredible. JOE KERNEN: And—but, there are statistics that you can point to and, I mean, there's been globalization, there's been the emergence of the Chinese work force. I mean, think of the way inequality around the world has gone down. But in certain developed countries, inequality is going-- going up. And there's a feeling that 50%, 60% of people in this country don't have access to the American dream like they used to. And that's what's spurring some of this talk from Jamie Dimon— I mean, he defended capitalism but he at least brought up that it's frayed, the American dream is frayed. I mean, what do you make of that? VICE PRESIDENT MIKE PENCE: --and was willing to go in and fight to make the American dream available for every American. JOE KERNEN: In the news, the last couple of days, you've got Mayor Pete Buttigieg is using-- invoking your name to I guess highlight a conservative push back to certain LGBT ideas or marriage equality, and the like. Is that fair to use you as the bogeyman in terms of, to point at you. And would you like to respond? I don't know if you've responded yet. VICE PRESIDENT MIKE PENCE: Well, look, I worked very closely with Mayor Pete when I was governor of the state of Indiana. We had a great working relationship. And, he’s said some things that are critical of my Christian faithand about me personally. And he-- he knows better. He knows me. VICE PRESIDENT MIKE PENCE: But I get it. You know, it's— look: again, 19 people running for President on that side. VICE PRESIDENT MIKE PENCE: In a party that's sliding off to the left. VICE PRESIDENT MIKE PENCE: --how much more liberal they can be. VICE PRESIDENT MIKE PENCE: And so, I get that. JOE KERNEN: --the country's evolved to some extent, I think, on marriage equality, on gay rights. Have you-- would you say your views have evolved at all since then? VICE PRESIDENT MIKE PENCE: Look, the Supreme Court has made their decision. JOE KERNEN: So you-- you accept it as law. VICE PRESIDENT MIKE PENCE: And when I-- and when I was governor of Indiana we fully implemented that decision into law. VICE PRESIDENT MIKE PENCE: But Joe, I have my Christian values. My family and I have a view of marriage that's informed by our faith. And we stand by that. But that doesn't mean that we're-- that we're critical of anyone else who has a different point of view. And one of the great things about this country is that our freedom of religion and the freedom of conscience. And, you know, we'll continue to cherish our values, cherish our views. But, look, one of the great things about this administration is from election night President Trump made it clear that we wanted to be an administration for every American. And I think when you look at the results of this administration, when you look at job creation and growth, when you look at how we've regrounded our courts with strong, principled conservatives in our federal courts at every level, the way we've rebuilt our military, restored the arsenal democracy, the way America's standing tall in the world once again and respected once again, my hope is that every American will understand that in President Donald Trump and in our Vice President that-- that we're fighting every day for a more prosperous and more secure future for them. JOE KERNEN: Mr. Vice President, I appreciate it very much, thank you. VICE PRESIDENT MIKE PENCE: Thank you, Joe. Good to see you. JOE KERNEN: Good to see you.